Agabus and others had prophesied to St. Paul along the way that trouble awaited him in Jerusalem (Acts 21:4-14). His arrest in Jerusalem was provoked when some Jews from the province of Asia accused St. Paul of bringing his coworker, the Ephesian gentile Trophimus, into the temple area (21:27-29). Stones in Greek warned Gentiles that entrance beyond the Court of the Gentiles was prohibited. Today one such stone is on display at the Istanbul Archaeological Museum; it reads: "No intruder is allowed in the courtyard and within the wall surrounding the temple. Those who enter will invite death for themselves". St. Paul languished in Roman custody for two years at Caesarea until he appealed to Caesar (24:1-26:32). 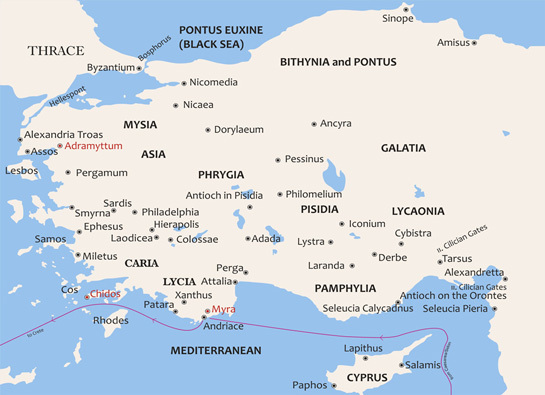 The northwest prevailing winds that blew across the Mediterranean forced ships sailing westward to hug the Anatolian coast of Cilicia and Pamphylia. At Myra in Lycia the Roman centurion transferred his prisoners to an Alexandrian ship returning to Rome (27:4-7). Such vessels were the most comfortable to sail on but would be heavily laden with grain to make bread for the Roman populace. The ship plodded slowly along Turkey's Carian coast until at Cnidus St. Paul glimpsed Anatolia for the last time on this trip. What followed was a harrowing shipwreck that cast St. Paul and his companions barely alive on the shores of Malta.